A beautiful and cozy mountain getaway for your family and friends. 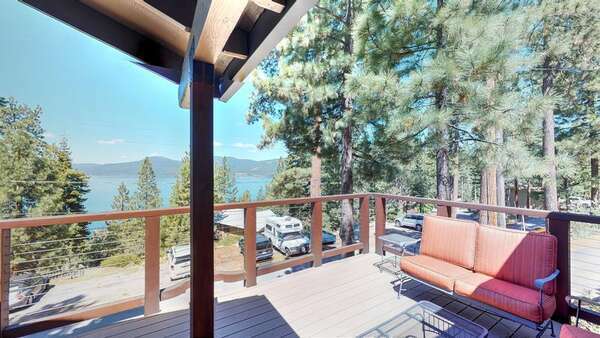 Our Mountain View Tahoe Donner Getaway is situated on top of Tahoe Donner and overlooks Northstar’s ski slopes, the breathtaking views will draw you in the minute you step into the house. Inside you’ll find a big open floor plan with a tastefully furnished living room, high vaulted ceilings, TV, and a wood-burning stove, off of the living room you’ll find a game room and a big deck that overlooks the mountains. On the same floor, there are 2 bedrooms, the master with on suite bathroom and a guest bedroom along with a half bath, the second floor takes you to a loft, 2 more bedrooms, and a full bathroom. This is a great home for a large group as it gives you privacy and plenty of space to spread with the extra game room and loft. Tahoe Donner Ski resort is only 3 minutes away, the club house is about 5 minutes away, Northstar and Squaw Valley within 20 minutes drive and plenty of hiking, biking and just walking off of your front door. Each eligible property is issued two guest cards to access the recreation fee amenities available in Tahoe Donner. Guest cards only allow for up to 4 guests per card. Guest access fees are currently $15 per person per day. Children 6 and under are free. Whatever the season Tahoe Donner offers a verity of activities, either you like the beach in the summer, the pool, a nice hike or a day of skiing followed by a relaxing evening at Trout Creek Recreational Center, you'll fall in love with this area. Summer Activities Include: Golf, Horseback Riding, Hike and Mountain Bike Tours, Bocce Ball and Archery. Winter Activities are: Downhill Skiing, Cross Country Skiing and Snowshoeing, Tubing and sledding.